It got cold today. It was after a fresh caught dinner of rockfish ceviche and ling cod tacos on DogBark!, tucked into the back of Ikeda Cove, on the southern end of Moresby Island in Haida Gwaii. As we dinghied across the bay in the mild twilight of 10:00pm, there was a new bite to the air that shook us from our summer mirage like the crack of a warning shot. “Get used to it”, the icy breeze seemed to say, “you’re not in Kansas anymore”. Since leaving Port Townsend on June 2, we have chugged north along the coast of British Columbia at a fast clip. In the first 10 days we covered 570 nautical miles and stopped in 14 different places. The weather windows aligned for a series of pleasantly uneventful crossings of traditionally dicey areas, including the Strait of Juan de Fuca, Johnston Strait and Queen Charlotte Sound. When the weather outlook is good, you don’t stick around to hang out with the notorious feral sheep on Jedidiah Island, no matter how much you’d love to. Instead, you haul anchor at 6am and run up Johnston Strait in unusual glassy seas and a cooperative current. Those good weather windows held temperatures in the “pants and sweaters” range, but now that we are far enough north to witness only 4 hours of nighttime darkness and more capricious weather, we find ourselves in the “fleece pants and down jackets and wool socks” range (though I’d imagine in a month or two, we will look back at our twilight dinghy trip across Ikeda Cove, wishing for an evening so warm). This cold snap is issuing in the first south east storm we’ve seen since we left. These storms roll across the Pacific and hammer this coast throughout the fall and winter but start to give way to the stabilizing north Pacific high in the summer. This time of year, day over day you can see the battles raging overhead; winter fighting to hold its ground with short bursts of intense rain and wind from the south, and summer gaining traction with its strong northwest winds under a deep blue sky. To “celebrate” this new cold weather, we stopped at our second Watchman site in Gwaii Haanas national Park Reserve on Gandll K’in Gwaayaay (Hotsprings Island). We had a good long soak in the hot baths, surrounded by forest and overlooking a peaceful crescent shaped bay. There was likely a village site on this island long ago, but little is known about it. 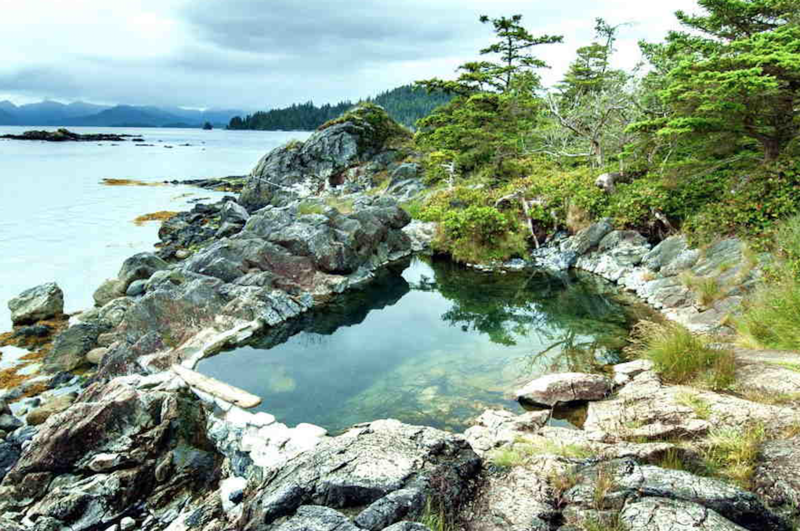 Ancient Haida communities certainly used these hot baths though, for their life renewing and healing powers (and perhaps to get clean, too). I am always surprised when I come across a natural phenomenon, like hot springs, and find out that we as humans are not actually sure how they work. The predominate working theory for the formation of these hotsprings is that rain water from nearby islands seeps through the rocks and deep into the earth, where it is held in a hot chamber a few miles underground. The pressure generated by making that water hot forces it up to the surface to be reveled by locals and visitors alike on a cold blustery day. In 2012, a 7.8 magnitude earthquake shook all of Moresby Island and shifted the ground at Gandll K’in Gwaayaay until it mysteriously blocked the source of hot water. For four years, the springs stayed dry. Eventually a few small trickles reappeared (not all of them in the same place as before the earthquake) and by the end of 2017, new basins had been fashioned to collect and enjoy the returning therapeutic waters. It was hard to tear ourselves away from such luxury, but that southeast blow was already filling in behind us and we needed to find shelter. Feeling relaxed and remarkably clean, we clamored back to the boats and headed to Crescent Inlet, an aptly name narrow bay protected from most any wind direction. After the veritable sprint up the coast of British Columbia, I found myself eager for a stormy day, hunkered down in a cove. They make great cozy days for sipping tea and playing games, baking bread and taking naps, and watching winter struggle through the seasonal battle overhead. Once this 30+ knot storms blows itself out, the forecast expects summer to take back its growing hold on this coast with a week of strong northwesterly winds and clear blue skies. These strong summer Northwest winds will keep it exciting as we chug north through the unprotected waters around Haida Gwaii. Winter may have won the battle, but summer is slowly and surely winning the war.